I love how quickly this dessert goes together. It’s inexpensive also, but always impresses. Back in my dating days, I used to go to a very trendy restaurant in St. Louis called Cyrano’s. It had almost a 50’s beatnik coffee house atmosphere as it was in a basement, the walls were all old exposed brick, exposed pipes, and lighting was mostly by candlelight. It was the 1960s and a very popular place to go after a movie. In those days we dressed up to go to the movies and we stood in line a long time to get a table all the while hoping the cobwebs wouldn’t get on our clothes. Cyrano’s specialized in rich ice cream desserts and Bananas Foster was always on the menu. You would eat a decadent dessert while talking soulfully over candlelight. Ah, romance! Bananas Foster is simply bananas warmed in a homemade caramel sauce with cinnamon and rum. (It’s much easier to eat if you slice the bananas before warming them.) Then you pour that on top of good vanilla ice cream. 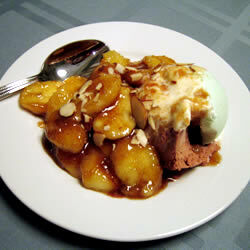 (You can also put some of the bananas in the dish first and top with a scoop of ice cream if you like.) Of course that melts the ice cream some and that’s part of the magic. All the caramel, cream, and rum meld to make a wonderful sauce. It’s hard to describe how wonderful it all becomes. You just have to try it! As you can see in the photo, some people like chocolate ice cream with this also. I’m too addicted to the vanilla version, but I might have to try the chocolate. Don’t keep the bananas on the stove very long or they will get too mushy; just warming them is perfect. You can omit the nuts as they are not usually used in Bananas Foster. anexactinglife, you have to try it! So good for such little work! I always wondered what Bananas Foster was!